Im a Fan of Emilio's Brick Oven Pizza... Are you? Fill in the below form and you can recommend ‘Emilio’s Brick Oven Pizza’ to a friend or family member via a text message. Show your support with a quick share of ‘Emilio’s Brick Oven Pizza’. Best pizza I\’ve ever had.. I\’ve been going there for years. Crust is perfect every time because it comes out of their brick oven. Topping are of the best quality. Roma and Julian are my favorite choices! Awesome Pizza and Salads! The owner treats us like family! Our favorite place for pizza! They have other tasty things on the menu but we love the pizza. We think it’s the best in the area! Hands down the best pizza I have ever had! Marinated tomatoes instead of the run of the mill sauce most places use, fresh sliced mozzarella and toppings, and the crust is so good people order it plain. Great atmosphere and the owner makes you feel like family. Best pizza and food around. Awesome salads and desserts. You can tell the ingredients is high quality and food is very fresh. No other place anywhere near is like there pizza. Emilio\’s pizza is the best! Not like any other in town – always delicious. The service is great and always friendly. Pizza iis awesome. Bread is awesome, Salads anfkanobs are all awesome. Italian imported brick oven. Wonderful Restaurant. the pizza is the best!! (you can\’t go wrong south anything really. ) the crust, the toppings, now I\’m hungry. their subs in the brick oven make for a hard decision every time i go, i end up doing pizza and sub to be safe. They have the best pizza. I’ve gone here since I was a kid and nothing has matched it. Brick oven pizza is like none other. So many options and the pizzas are generous. I’ve had a lot of pizza in my life, but nothing compares to Emilio’s. I’ve probably been eating there for 15 years now, and I have no plans to stop. Keep up the great work! They have the most delicious pizza and fresh ingredients. Fabulous pizza and salads, even better people. Feels like you\\\’re part of the family when you eat here! And food is amazing! My daughter worked there a few years back and the food and service where fantastic! Good food, good fun! We’ve been going to Emilio’s since 1998, and it’s always been the best pizza around. Fresh ingredients, and combinations you won’t find anywhere else. Friendly family atmosphere, in a family-run business. From the time I walked in the door I was in love. I love the people and the salads and the PIZZA! There is no other place for pizza. The crust is thin, the cheese is fresh, the sauce, Mama Mia! Other pizzas are greasy, Emilio\’s is not. I am a RAVING FAN of Emilio\’s! We’ve been a fan of Emilio’s for more than 15 years to the extent of even having many family celebrations there. The pizza is high quality and outstanding. Likewise the sandwiches and other options on the menu are just great! In addition the restaurant is run by a wonderful family who always makes you feel attended to and very welcome! Fantastic food!!! Beautiful pizzas! We love this place! I wish I could show you a photo here! 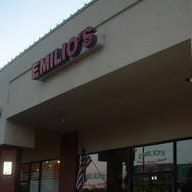 I’ve been going to Emilio’s for years! By far they have the BEST gourmet pizza in all of Northern Virginia. However, you really can’t go wrong with anything on their menu; I never leave disappointed. The best part is that you can actually experience the family-oriented atmosphere which is a great change from dining at the same old same-old chain restaurants. Highly recommend!!! Emilio\’s has been a family favorite for 10 years! From the quality ingredients to the authentic Italian food! Simply delicious every time. The owner make us feel like family!! Try this place you won\’t be disappointed! Emilio has been a cornerstone of the Ashburn/Sterling area for many years…the best people and food ever! Love Emilio\’s!!! I was a regular until I moved to NYC. Every time I came back to visit it was on the top of my list! Back in VA now and it\’s still my favorite pizza. Best and freshest ingredients. Homemade dough and sauce, fresh ingredients and toppings, unbelievable crust, do I need to say more? Hands down the best pizza in the area! If you want fresh authentic brick oven pizza, check out this place. My favorite pizzas they have are the Julian and the Roma. Very friendly and helpful staff. Large selection of beverages as well. I will definitely be back. Sterling’s hidden gem! The homemade crust and sauce are to die for. If you aren’t there, you’re missing out. I love Emilio\’s! The pizza is delicious – best crust ever! Roya, the owner, is so warm and welcoming. Their live music is fun too! The OG brick oven pizza restaurant in Loudoun Country! Best pizza sauce and dough to compliment fresh and delicious toppings. Emelio’s has the best pizza and the calzones are my favorite. My husband and i have been going to eat there for over 10 years and they are still the best! If you want authentic brick oven pizza, this is the place to go. The dough has been a family secret for years and is hands down the best recipe in northern Virginia. Best pizza I’ve ever had! I was an employee at Emilio’s a long time ago I ate there all the time and never got tired of the food. Since then it has gone through many changes, as have I. I have tried wonderful pizza all over the world and still nothing quite hits the spot like Emilio’s pizza, for me particularly it’s their Puttanesca. Still when I visit my family I always insist we go eat at Emilio’s. Such amazing pizza, can’t go wrong with any choice! Always a friendly environment! They have some of the best pizza around, and they always make you feel like family!!! Best pizza in the area. Love the owner. Very friendly every time we come in. Great family restaurant! Pizza and Salads are amazing! Emilio\\\\\\\’s has the best pizza by far. Great selection, fresh ingredients, and even gluten free pizza!!!!! I would recommend to all of my friends!!!! Plus, awesome atmosphere and live music on Saturday.